Did you get a glimpse of what the title meant ? 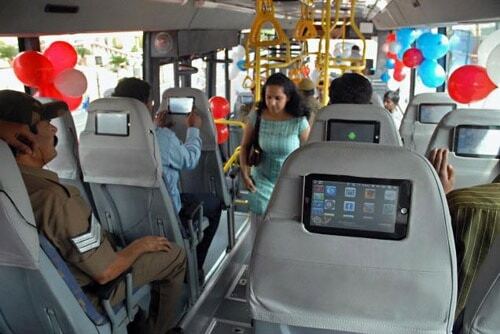 It means that BMTC (Bangalore Metropolitan Transport Corporation) will now provide it’s passengers access to Internet & information containing Softwares. Currently, this service is embedded only in the Vayu Vajra bus service which plies from ITPB (International Tech Park Bangalore) formerly know as ITPL to the Bengaluru International Airport. We have seen the use of technology in buses earlier. For example the buses in Mumbai run adverts on a small flat screen. Though the noise made by the repeated advertisements is crappy. But now you can stay connected to your Social friends using this Internet. In today’s world of Social Networks it’s very important for us to stay online most of time. For making ICE On wheels — An initiative to provide Information, Communication & Entertainment; a success BMTC has teamed up with a Bangalore based Tech firm EAFT Technologies. The main of this project is to ensure that most people in the city use Public transport to travel anywhere in the city limits rather than opting for a public vehicle. Surprisingly the BMTC has stated that no extra charge would be taken from the travelers for this. The Internet access would be given in the form of Wi-Fi’s which would be setup at custom locations in the vicinity of the route between ITPB & the Airport. So you can expect uninterrupted Internet access the next time you travel in that bus. Also, the passengers would be provided with Software’s containing Flight Information, facilities to Book tickets & do Online check-in’s while commuting. Now the customer response to these new features is gauged & on the basis of that the BMTC will decide whether to start running similar buses around the city for different routes or to scrap this idea. For more such Local News, tech related information & Social Media updates, Subscribe to our Daily Updates / RSS Feeds. Do you think such Buses will last for a long time when there is so much rush in the peak hours ?? access internet while you’re riding your bicycle. Everyone can understand that cant they? Well I’m not so sure. Nobody seems to care about anything that’s happening anymore. People will keep on polluting, throwing trash on the ground…. Really Interesting. But I have not in any buses here in Bangalore. I dont think so its required in the buses. These buses look pretty cool with those ICE! Hey, its in news? I’m from Bangalore (ITPL) and i’ve been in that bus. Its Volvo bus, costing around 75 Lakhs.. Even though BTMC introduced Mercedes and Other buses in Bangalore, it was not a hit as Volvo. You can find more Volvos in ITPL than regular buses. This is because ITPL is where most MNC IT companies are located, so Govt implemented this to reduce traffic, from the IT employees, basically these guys only travel in 4 wheelers for luxury, so there must be atleast volvo buses to attract them. And yet still Bangalore roads are full of vehicles!! But public transport system in bangalore is awesome, marcopolos buses for regular commuters and many different buses for diff status and fares. And also all with digital boards for rout details.I’m uploading a picture of ITPL rd, if you would like to update this post.This pic is not exactly from ITPL but its nearby. Thinking to plan a trip to Bangalore? Then you can take a pass from BMTC costing some RS 150 for volvo and 40RS for others, and you can travel unlimited in any buses around b’lore city for 24 hrs. Wow, that pretty neat ! But Indian buses are so crowded most of the time, I don’t think this tech will work for long ! Thank you look pretty cool with those ICE!